Connecticut Governor Dannel Malloy has announced that the “Hartford Line” commuter rail service – between New Haven, Hartford, and Springfield, Ma. – will start in May 2018. When the Hartford Line service launches, a total of 17 roundtrip trains between New Haven and Hartford will operate each weekday, with 12 of those roundtrip trains continuing to Springfield. On weekends, a total of 13 roundtrip trains will operate between New Haven and Hartford, with 9 of those trains continuing onto Springfield. A joint venture of TransitAmerica Services and Alternate Concepts was chosen over Amtrak and three other bidders as the service provider for the service. Amtrak operated an inspection train from St. Albans, Vt. (SAB) to Montreal (MTR) on Tuesday, July 18, 2017 – another clear signal that plans are progressing to extend the Vermonter north into Canada. In this image the inspection train is seen crossing the upper part of Lake Champlain on the New England Central railroad (NECR) trestle at East Alburgh, Vt. Various reports suggest that Amtrak President & CEO Wick Moorman was on the train along with other U.S. and Canadian officials. People who remember taking Amtrak’s former overnight train – the “Montrealer” – north may recall that crossing this trestle was the indication that the train was just moments away from entering Canada. Sheraton Monarch Place Hotel – Springfield, Ma. Note that this meeting is open to the public. The keynote speaker will be Robert Puentes, President/CEO of the Eno Center for Transportation. Panelists will include five members of Congress from the region: Richard Neal and James McGovern from Massachusetts and John Larson, Rosa DeLauro, and Elizabeth Esty from Connecticut. The meeting agenda also includes plans for talks by Connecticut Commissioner of Transportation James Redeker and his counterpart in the Bay State, Stephanie Pollack, Secretary/CEO of the Massachusetts Department of Transportation. The Massachusetts Department of Transportation (MassDOT) has posted a copy of the recently completed Central Corridor Passenger Rail Feasibility Study on their website. The study, which apparently has been in the works since 2014, examines the implementation and operation of intercity passenger rail service along the Central Corridor. The Central Corridor is a freight rail line running north-south approximately 100 miles between Brattleboro, Vt. and New London, Ct., including the communities of Amherst and Palmer, MA. MassDOT conducted the feasibility study to examine potential for intercity passenger rail service along the Central Corridor. It is unclear at this time what if anything MassDOT plans to do now that this study is complete. Rebooting New England, a Fall 2016 graduate planning studio convened by the University of Pennsylvania’s School of Design, sets forth a strategy to rebuild the economy of New England’s cities, which have been bypassed economically and physically for decades. This strategy is underpinned by a modern high-performance rail network between New York and Boston that would link all of New England’s urban centers with these two global cities and with each other. The 184-page report, which is audacious in its scope, looked closely at the UK initiative known as the “Northern Powerhouse”, an economic revitalization plan for the North of England and its older industrial cities. Underlying this strategy is the $52 billion high-speed rail project, which will link London with Manchester and Leeds. Another planned line will create a network that links all of the major cities in the North of England with each other. 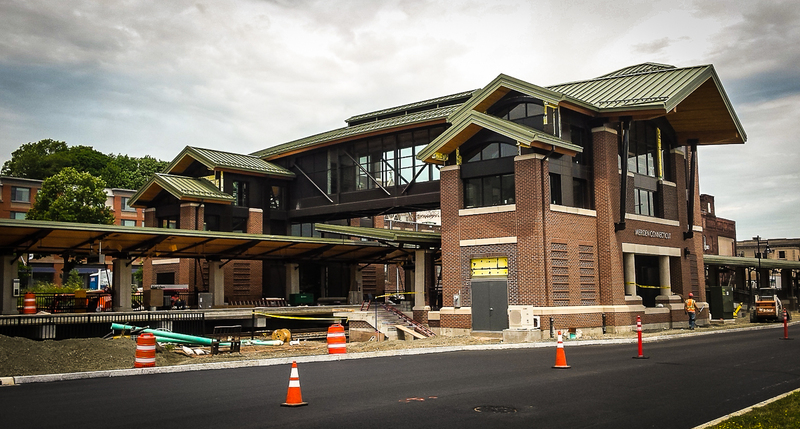 The station information pages on the website have been updated and refreshed. 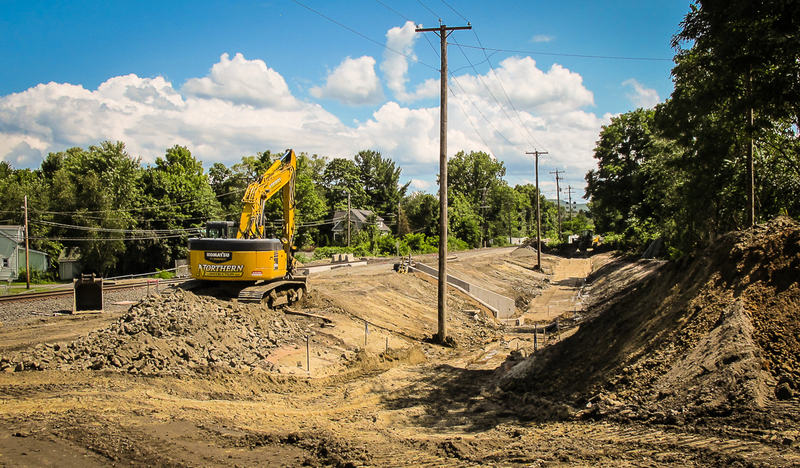 Continued progress at the bike and pedestrian underpass work site in Northampton.